Now that music-based videogames have become one of the most successful and lucrative genres in the industry, Warner Music Group wants a bigger piece of the pie. Edgar Bronfman, CEO of Warner Music, compared the efforts of modern videogame companies like Activision Blizzard and Harmonix with the launch of MTV or the iPod. "The amount being paid to the music industry, even though their games are entirely dependent on the content we own and control, is far too small," he said. According to Gamasutra, Warner has an interest in games like Rock Band and Guitar Hero due to its relationship with many of the bands featured in the games, such as Metallica, Linkin Park and The Used. Warner Music is the third-largest music company in the world, with 2007 revenues totaling almost $3.4 billion. And while Bronfman himself has been one of the industry's most vociferous critics of music piracy and helped lead the charge against Napster, the original music sharing program, he has recently shown signs of softening his stance: During a November 2007 address of the GSMA Mobile Asia Congress, Bronfman warned mobile companies against making the same mistakes that caused the music industry so much grief. "We used to fool ourselves. We used to think our content was perfect just exactly as it was," he said. "We expected our business would remain blissfully unaffected even as the world of interactivity, constant connection and file sharing was exploding. And of course we were wrong. How were we wrong? By standing still or moving at a glacial pace, we inadvertently went to war with consumers by denying them what they wanted and could otherwise find and as a result of course, consumers won." 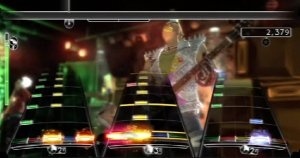 While it's not unreasonable that the industry responsible for creating the content that drives these games would want in on the action, titles like Rock Band and Guitar Hero offer musicians new avenues of exposure and unprecedented access to brand-new audiences; meanwhile, the music industry's endless insistence on more money from every imaginable aspect of the business hasn't served it very well thus far. Perhaps a compromise is in order?